Full Metal Monsters is an action-packed game that lets you recruit and battle mechanized beasts to fight in a 5 vs. 5 multiplayer match. 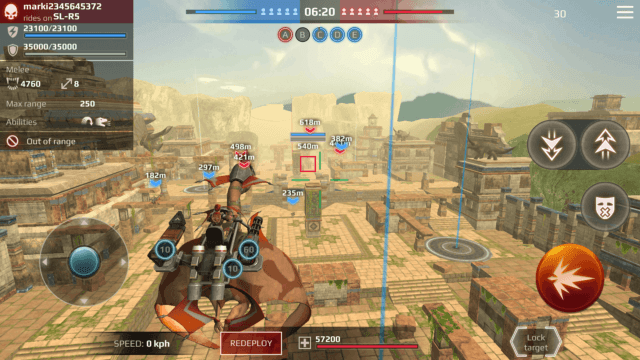 The game’s intense real-time battles pits you against 5 more enemy dinosaurs. You and your team must vanquish the enemy team before the timer hits zero. Whether you are riding a winged dinosaur or a ground-running predatory beast, do not keep still while firing at enemies, especially when you are surrounded by them. Keep moving while attacking. Move back, forward or sideways to confuse your opponents. You can also hide behind a structure for a few seconds just to deflect your enemy’s attention from your rider. Once your enemy loses focus, you can again attack him or his team mates. When you sense danger, back off. Keep moving and choose another path within the map to spring a surprise attack. This is the first thing you should do when you unlock the second dinosaur. Usually, you will keep unlocking dinosaurs when you level up. Leveling up is easy as you will have to win multiplayer matches to gain XP. When you unlock the second dino, tap “riders” on the right side of the home screen and spend yellow colored “D-crystals” to purchase a new rider. You will receive 150 D-Crystals as bonus “Welcome” rewards just after the mini-tutorial ends. You will also get some crystals as rewards when you level up or win a PvP conquest match. 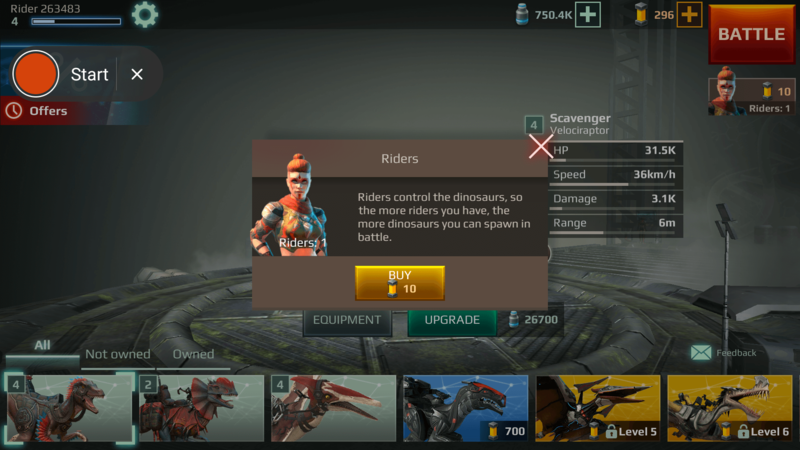 Make sure you purchase at least two more riders using D-crystals as soon as you unlock the second and the third dinosaurs when you reach level 2 and level 3 respectively. These two dinosaurs are free, but from level 4 onwards, you will have to spend D-crystals to purchase some advanced mech beasts. Of course, there might be a few dinos that will be unlocked for free, so reach new levels to see which of the locked dinos costs D-crystals and which are free. While attacking enemies, you should have a clear idea of your opponent’s HP and your rider’s HP. Just move your reticle to an enemy, inside the red bordered square to check his HP on the top-left corner of the screen. Your current rider’s HP is displayed on the bottom of the screen. Do remember that the enemy HP box on the top-left of the screen shows the health of an enemy on which the aiming reticle is positioned. To keep the HP stats fixed, you should keep the reticle locked on to an enemy by tapping the lock target button on the bottom of the screen. As you auto attack your enemy, his HP will keep decreasing until it reaches zero. Your HP too will keep decreasing when an enemy attack your rider. You can see your health on the bottom of the screen. When you reach level 3, you will have three dinosaurs. Make sure you purchase two more additional riders to ride them. When a match begins, the game will ask you to choose a starting dinosaur. You can choose any one of the first three unlocked beasts. While it depends on your battle beast choices, I would recommend “Pterodactylus”, the winged dino. You must have an upper hand in battle and with a pterodactylus, you can attack ground-running dinosaurs. It will also be easy for you to dodge attacks from enemies, from both winged and ground-running dinos. Make sure you tap the fly button until you reach the highest point in the sky and then attack ground enemies. Head straight to settings (gear icon) on the upper-left corner your home screen and under Gameplay > Smart Fire select “All Weapons”. 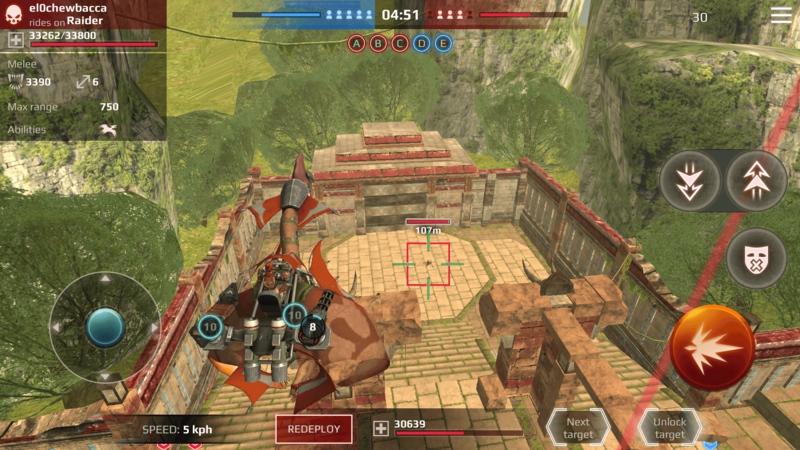 This will enable auto mode for rocket launchers. Note that rocket launchers deal AoE (Area of Effect) damage and their attack range is much shorter than other weapons, so you will have to pretty close to an enemy to auto-fire at him. Boost your dinosaur’s stats from time to time if you are serious about winning multiplayer conquest matches. There are four major stats – HP, Speed, Damage and Range. You will need blue e-cells to upgrade a dino’s key stats such as HP and damage. You will easily acquire e-cells from a match. You will also receive e-cells when you level up. As “welcome” rewards, you will get a whopping 700000 e-cells. Make proper use of them and level up your dinosaurs frequently. To increase a dinosaur’s stats, tap a dino’s portrait and then tap the “upgrade” button. At the top-right corner of the screen you will see its stats, including those that will see a potential increase when you upgrade it. Upgrading a dinosaur takes time, but you can speed up upgrades using D-crystals. During battle, it becomes difficult to attack a single enemy because in most occasions, your opponents will attack in groups. Whether you have chosen a winged dino or a ground-running creature as your starting dinosaur, you will always have to be on a lookout for an enemy which is isolated from the group. Once you have zeroed in on an enemy by moving the reticle inside the red bordered overlay on a dino, see to it that your rider is automatically firing at it. You can now tap the “lock target” button. When you do this, your rider will attack only that enemy unless you tap the unlock target button. With Smart Fire turned on (more on this later), your rider usually attacks an enemy automatically when it comes within his range. When you tap “lock target” your will be attacking only the target enemy until it dies or if you have unlocked target. Do remember that your “lock” status will be disabled if your enemy runs away and is not within your firing range. You will have to move closer to it until it is in your firing range and then tap the lock button again and make sure the enemy dinosaur. Hint: Lock isn’t disabled if there are obstacles between your rider and the enemy, so you can lock target behind obstacles before attacking it. Besides leveling up key stats such as damage and HP, you should also consider upgrading your beast’s firepower. The weapons mounted on a beast must be upgraded if you want to deal more damage to your enemy. When you upgrade a weapon, it improves key stats such as loading time of a weapon and damage. To level up equipment, you will need e-cells. Tap a dino’s portrait and then tap equipment. Next, tap a weapon’s profile on the left side of the screen to select it and then select upgrade. Level up both dino and equipped weapons frequently to make it more powerful. Each dinosaur has a unique ability in Full Metal Monsters. For example: the winged “Stormherald” has special abilities like “Flight” and “Silence”. When you tap the silence button on the right side of the screen, you actually “mute” your enemy’s firepower for a few seconds, which means he won’t be able to attack you for a brief period. Another dinosaur, called “Chaser”, has a unique “Dash” ability that allows it to rush into an enemy when you tap the dash button. You can find a brief description about each dino ability by tapping the dinosaur’s portrait pic on the bottom of the screen. It’s on the right side of the screen. You can also find info about a locked dinosaur’s ability when you tap its portrait pic. Besides shooting from a distance, you can also engage in melee combat if you move closer to an enemy dinosaur. When you are too close to an enemy, your dinosaur will start biting it. To deal double damage, tap the fire button or let Smart Fire kick in while biting an enemy. However, this can be a bit risky attempt and you should try it only when you see a dinosaur isolated from the group. Tip: If you have selected “Chaser”, then do use its Dash ability to dash into an enemy and then bite and shoot at the same time to deal more damage.